In winter the gardener’s eye is scanning the landscape for anything and everything that will fill our enormous desire for the beauty to which we had been treated all summer and fall. Any sign of an emerging spring is trumpeted! And thus one is inclined to see what is ordinarily lost in the splendor of roses and hydrangea, of trumpet vine and forsythia. Attention now hungrily focuses on the humble wild violet. At least that’s how it is here. I cherish this time of year as there is a large section of the front lawn that bursts with these tiny purple treasures and I delight in their beauty, fortitude, and resilience. But there was a time, I must admit when I had taken them for granted. Indeed, the only moment they really had placed themselves squarely on my inner radar was when I was researching butterfly habitat one summer, and made a mental note that the wild violet was hospitable to the eggs of the fritillary butterfly. I was glad to make note of their pragmatic presence, but a true appreciation certainly did not emerge. They remained in the background, lopped off when I cut the lawn. I did note they did resurface—and spread. In the many years I have been on this property I have let the violets wander where they will. I actually welcomed them into the crevices between the flagstone pavers I’d put down in front of the rose arbor. I thanked them, and they obligingly spread their tentacles and took up even more room. Not a word of regret came from me. Hardly. My admiration only grew. Charmingly, they kept a pinkish violet company which I’d purchased at a local nursery. (How did those escape the pot for which I paid good money, and become part of the natural landscape? You tell me!) Of course I assume the pink one is a hybrid. But the wild violet? How did it end up here? I have no idea. I only know it’s tenacious. I suppose that in itself answers many questions. When at last the wild violets captured my curiosity sufficiently that I wanted to write about them, I began to research and was shocked and appalled and saddened to see how very many references were regarding how to get rid of them. “How to Remove Wild Violets from Your Lawn” was a common theme. They spoke of poisons, though even poisons apparently are not that effective. It apparently was more aggressive than even I anticipated. And the articles I found were discouragingly not what I was looking for. Not at all. My intention was only to praise their beauty and express my gratitude that they had chosen to live here and delight my days. Perhaps one reason violets so appeal to me is that I am completely enchanted by small bouquets. Violets lend themselves perfectly to this passion of mine. When I finally wrote of wild violets and posted to the Net, I was amazed at how many people wrote to me around the country asking how to care for them, and where to buy them! Clearly there is far more interest in cultivating them than in destroying them. With a growing emphasis in landscaping on varying our front yards to include far more than simply grasses, there is also a corresponding opportunity to introduce violets back into our environment. They are trouble free, lovely to see, beauteous additions to tiny bouquets, and if you mow them down, they don’t suffer, but simply return and continue on wherever they were going anyway. Kathryn Hall is the author of Plant Whatever Brings You Joy: Blessed Wisdom from the Garden, available on Amazon and Barnes and Noble and indie bookstores. For more information please visit her blog at plantwhateverbringsyoujoy.com. Two Days Before the Opening . . . Note from Tricia: This is a habun … prose poem plus haiku. Most of the topiaries are full-bodied in vine-twist sinew and leafy bulk – the bamboo-chewing panda rolling and a thoughtful shaggy dog. The green-brown horses stand as tall as monuments to freedom. A dragon with curvy red horns commands respect. Puddles accumulate waves on walkways, a reason to scurry into the Insectarium, a museum of dry insect skeletons skewered on pins with labels. An afternoon admiring what does not move. A gentle rain is falling. It’s evening now and all is quiet. Too quiet! With every passing moment the garden, the malignant garden is growing. We’ve warned friends to watch out, that the squash vines may be growing faster than they can run! Savvy friends visiting our ranch know about our squash problem and lock their cars, lest their back seats somehow mysteriously become filled with zucchini, neatly stacked like cord wood. And yet her pansies and cosmos have hurdled log end edging and are marching out into the gravel drive. I’ve warned her that I’m close to classifying these as noxious weeds and considering getting after them with Round Up and the weed eater! But her pleas for mercy melt my resolve. . . . Meanwhile Johnny jump ups huddle and plot from under the front deck. Our garden is planted right up to our bedroom windows. Just outside huge waving zucchini leaves and six foot sunflower stalks resemble the flags and standards of a besieging Roman army. Snapdragons crowd the bottom edge of the living room picture window, peeping in at us. Petunias and marigolds riot in barrels on the front deck. Apparently the volunteer plant army is being all it can be. . . .
Friends, practical friends, engineer friends have tried to warn me off gardening altogether. “With the time and money invested, you’re way better off just buying your produce from the store.” People do wonder why we’d spend hard earned money on garden tools that unfortunately fit our hands so that we can then engage in backbreaking work and come in at days end all sweaty and with socks black around the ankles. And then my logical, practical engineer friends wonder aloud why, at the very least, why I would be a willing accomplice to my wife’s folly? “Waste of time and money!” I hear it again and again. But it’s a hobby. Last year we pulled in over 200 pounds, wheelbarrow loads of winter squash (and I love the stuff) from our garden. The squash in our root cellar fed us and some friends too, clear into the next May. We buy vegetables only 12 weeks a year. No, not practical perhaps, but how many hobbies pay any dividend at all? I remember my sweetie laughing and saying that spaghetti squash is $1.79 a pound at the market. “We’re squash millionaires!” was her laughter filled observation. Thinking of my very practical friends, none of whom garden, I am reminded of an old saying about folks who know the cost of everything and the value of nothing. The simple and biggest reason that I am a willing accomplice in the garden is that it makes her happy. She bursts through the door in her huge sun hat, a rose blush to her tanned cheeks and grinning from ear to ear. “Have you seen the peas today?” she asks, and: “The corn is as high as an elephant’s eye! Come! Come see!” She takes my hand and together we step out into late summer golden evening light to survey our garden and its eager, optimistic and leaping growth. Evenings on the ranch become chilly as darkness comes sooner with autumn. Then one night there’s a touch of frost and the squash vine’s leaves collapse like damp tissue paper. We let our squash turn a deep golden yellow on the vines and before the nights become too cold, we harvest them all. Ultimately even our hardiest plants succumb to the encroaching, inexorable icy breath of winter. Daylight grows short and winter is with us in earnest. Caught in icy winds, trees naked and skeletal beat their knobby, sere branches against our west windows. Wind moans around the house and snow crystals pile up in drifts on the deck where once in our memory of longer days we sat taking it all in, drinking tea and breathing fragrant warm evening air. Winter wears on at the ranch. I come in from feeding and breaking the ice off the animals’ water with chapped cold cheeks and a frigid dripping nose. Shucking snowy boots, I pad over and do the wood stove hug, closely encircling but not touching the hot stove pipe. Water sizzles as the snow melts off of me and patters onto the stove top. Warmed but still damp, I sit for dinner. The wind rises and our stove pipe shudders. In pitch blackness snow hisses against dark window panes. Smiling proudly, she sets it all before me. Our beloved squash, bursting with flavor, awaits my fork. I smile up at her smiling down. Before I even touch the chicken, I dig my fork into a hot, sweet and buttery mound—of summer. 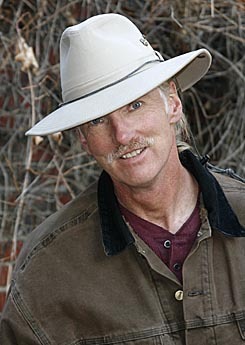 Rancher/writer Tom Preble lives in his self-built, earth-bermed, and energy-efficient home and ranch on the Palmer Divide east of Colorado Springs, Colorado. Something of a Renaissance Man, Tom has wide ranging interests, from astronomy to welding to philosophy. Trained as a computer electronics engineer, Tom is retired now and looks forward to expanding his writing. Squirrel by Tim Felce (Airwolfhound), via Wikimedia Commons (edited).